For brand new gun owners, determining the best place to keep your gun could be tasking. Some of us stuck our guns on the nightstand the first night we brought it home. We did that the first time because we were not sure where to keep it and that’s okay for the first time. But it isn’t a safe place to keep your weapon. You need a secure location to keep your guns at home. While opinions and options might differ and state laws also differs from state to state, there are still some appropriate restrictions on where and how you keep guns in America. Also, if you have kids, it is your responsibility to store it where no one can have access to it. New York and Chicago have laws against negligent storage which means when you bring a gun home, it must have a locking device attached to prevent the accidental discharge of the weapon. If you do not have children, you may feel keeping your weapon anywhere in the home is okay as long as there won’t be any unauthorized access to it. Some guns come with a holster that can be fitted between your mattress and the box springs for those who want to be more discreet. You can also store them strategically through your house – even in the bathroom, nightstand or even the living room next to your bedroom. If you have a shotgun as a home defense gun, you need it to be close to you at all times – keeping it next to the bed or behind the headboard is a great place as well. For those who have handguns and revolvers, you can keep them in a holster at home. This is a wise choice actually, as it allows access to your guns anywhere you might be in the home. If you keep it loaded and place it on the table, while you run off to the yard, you might not have enough time to get the gun in the case of a home invasion. Another great way of storing your handguns and long guns is by using gun safes. They are quite suitable for homes with or without children. Using gun safes in your home prevents not just unauthorized access from your kids but it also keeps burglars away from stealing them or worse, using them against you. There are a lot of firearm safes available on the market. Some provide easy access to your weapon while others are designed to store a large number of firearms all at once. Your firearm needs to be secured and accessible to you at all times especially if it’s a self-defense gun. There are a couple of gun safes with biometric and electronic options but they typically fit only handguns or revolvers. You can’t keep a shotgun in there. Barska is one popular name in the industry known for pushing the boundaries for gun safes. They have a biometric gun safe for both long guns and handguns. Some people prefer to buy electronic safes because they come with a combination of an electronic lock and a backup key override – should the electronic lock fail and you need to access your firearm. Biometric safes are often quicker to retrieve the firearm unlike safes with keys. All you need to do is to place your fingerprint on them and it will open up the safe to you. GunVault’s Deluxe Vault is a great option for biometric because it uses your fingerprint to open up access to you. It also has more space to hold more than a weapon. It can hold your ammunition as well. With features such as motion sensor and a low-battery warning, you won’t find any reason to buy another gun safe after this. Their safes are also way more affordable than the rest of its competitors. If you intend buying multiple firearms and other forms of long guns, you might need to check out Sentry Safes and Winchester – they offer the most durable and secure gun safes for holding multiple long guns. One feature I like checking for when searching for a gun to purchase is a hardware to bolt down the safe. This way you’re sure a burglar won’t carry off the safe while you’re away. If your safe doesn’t have a hardware to bolt it down, it might be pried open with a crossbow. A bolted-down safe is perfect for any firearm. Hiding a firearm without a safe is not a secure way of keeping it secured. There are however concealment products that you can use to keep your guns from prying eyes. 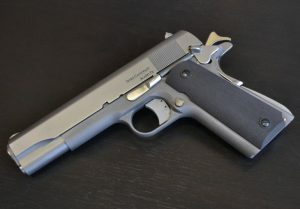 We have the Cheaper Than Dirt which carries three products that look like typical household decorations but in fact, the whole design is created to conceal a firearm. You could also check out for books or working clocks designed to hide firearms. Burglars know where to look to find a firearm which is why you need to bolt your safe down in order to keep it safe from intruders. They want to get into your house, get the items and make a run for it. This is why your weapon needs to be securely stored so it doesn’t end up being stolen or used against you.